Apart from perhaps Ladbrokes, William Hill is probably the name you're most likely to associate with betting. It's certainly hard to walk down any high-street without being greeted by the famous name and the "promise" of some nice profits. 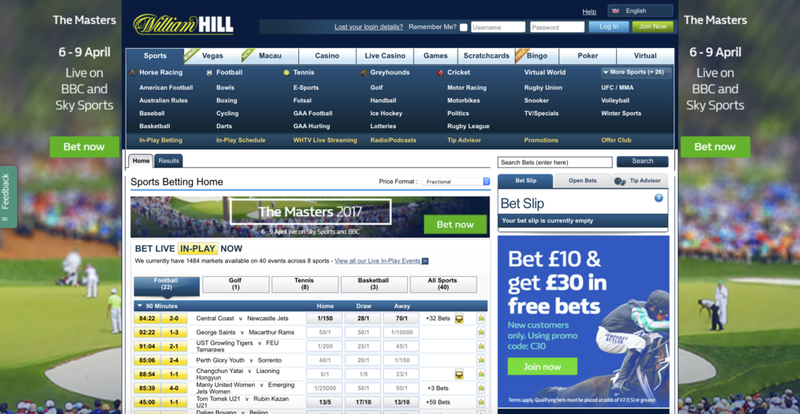 William Hill was also one of the first bookmakers to move online through a partnership with platform provider, Playtech, and although it experienced some problems when it more recently decided to go it alone, it appears to have turned a corner and new management has refreshed the product. William Hill is notable for not (as yet) having participated in the recent round of industry consolidation. Potential tie-ups with Amaya (Poker Stars), GVC and 888 have so far come to nothing. What you get with William Hill is competitive odds, reliability and the reassurance your betting with one of the industry's biggest names. Free bets totalling £30 (3x £10) are currently on offer to new customers. Just make sure to use the "C30" bonus code and place your qualifying bet at odds of 1/2 (decimal 1.5) or greater. Free bet stakes are not returned with winnings, so find matched bets at high odds to maximise profit. Customers using Skrill, Skrill 1-Tap, Neteller, Moneybookers or PaySafe to deposit will not qualify for the C30 promotion.